While Sydney and Melbourne boomed over the last three years, thousands of Australians sat frustrated on the sidelines wanting a piece of the action but couldn’t afford to get in to the market. As the splinters penetrated the skin of those onlookers, dozens of other (significantly more affordable) lesser-known locations throughout Australia were also producing strong price growth plus the added bonus of being much kinder on the household budget than Sydney or Melbourne. More Australians didn’t benefit from Sydney and Melbourne’s boom than those who did – investing in property is not easy. “Just buy a basic 3-bedroom house in a so-called blue-chip inner-Sydney location like Leichhardt where you can make money while you sleep”, they say. Core Logic data confirms a 50 per cent increase in value over the 3 years ending May 2017. Sounds like money for jam! Except that, with Leichhardt’s current median house price of $1,701,000, your 20 per cent deposit and acquisition costs like stamp duty equates to $440,000. Do you have that sitting in your undie drawer? Don’t worry, just borrow against the equity in your family home. There’s just a small – well, not so small – catch with that. If you do actually have that sought of equity readily available, can you afford the ridiculously high $50,000 per year to cover the shortfall between rental income and investment expenses? No. Never mind, just switch to Plan B – Melbourne. Apparently, investing within the Monash municipality with popular eastern suburbs like Chadstone, Ashwood and Glen Waverley is another no-brainer. While the median house price of $1,155,000 is much more affordable than a property in Sydney of comparable proximity to the CBD, that’s still a lot of coin. Maybe an apartment works for your budget (Monash’s median unit value is $645,000)? To avoid mortgage insurance, you’ll need $167,000 cash savings to cover deposit and costs. But, Melbourne has Australia’s lowest rent yields so the costs to hold are $8,000 per year (or double that if you’re borrowing against equity in an existing property for the deposit). And, due to Melbourne’s record volume of recent apartment supply, the median unit price increased by a much more modest 23 per cent over the last 3 years. According to official data from Core Logic, Guyra in New South Wales achieved comparable rates of growth to Sydney’s blue-chip suburbs. Today’s median house price in the Northern Tablelands township is an incredibly low $280,000 after increasing by a whopping 50 per cent over the 3 years ending May 2017. Relative to the rest of Australia, the money required to cover a deposit and acquisition costs to get in to the Guyra market is nominal, the annual holding costs barely touch the household budget, and the capital growth already achieved was superior to 95 per cent of Australia. One of the biggest myths in real estate is that capital cities are the best investments. 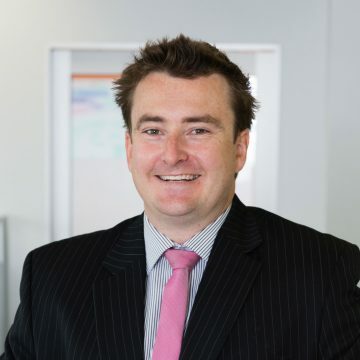 It always fascinates me how so many investors are oblivious to the opportunities throughout regional Australia where, generally speaking, it costs much less to enter the market, annual holding costs are lower, and potential for price growth can be superior to many high-profile cities. The average annual change in median house price in Guyra since the turn of the century remains superior to all capital cities. And, the same can be said about numerous locations outside of capital cities where housing is extremely affordable. High profile council areas such as Brisbane (18.2 per cent), Perth (4.9 per cent), and Adelaide (7.7 per cent) produced inferior price growth over the last 3 years than numerous non-capital city locations. Small fish are often sweeter! For example, the median house price in the Queensland regional town of Goondiwindi is still only $310,000 and investors would have achieved a superior total return on investment over the last 3 years than in metropolitan Brisbane. Sunshine Coast ($550,000) and Gold Coast ($618,000) have also outperformed the state’s capital. Regional locations such as Scenic Rim, Cairns, and Toowoomba produced similar total returns as Greater-Brisbane municipalities Logan, Ipswich and Moreton Bay. Motivated investors with a tight budget would have already made a handsome sum if they invested in parts of Tasmania three years ago. Throughout most of the state, the low entry price and high rental yields means that an investment property will usually be cash flow neutral or better – good luck getting that in Sydney or Melbourne! The compounding price growth over the last 3-years has already been attractive in regional locations such as Circular Head (28.1 per cent) and Huon Valley (17.9 per cent). And, with the recent resurgence in Tasmania’s economy, extremely affordable housing, and very tight supply, Propertyology maintains an active interest in anticipation that the best years for capital growth in Tasmania are still ahead of us. Aside from Sydney and Melbourne, Hobart (27.1 per cent) produced Australia’s best capital city price growth over the last three years while the annual holding cost for an investor who borrows 80 per cent of the purchase price is probably zero. The north Hobart municipality of Glenorchy, with a median house price of $301,000, already produced 18 per cent price growth over the last year 3 years, and is cash flow positive to the tune of $2,500 per annum. Instead of sitting on the sidelines frustrated at being unable to afford to invest in Melbourne, one could have enjoyed 21 per cent price growth over the last 3 years from a typical property in the Victorian local government authorities of Colac or Alpine, where the median house price is under $340,000. That growth is on par with many parts of Greater-Melbourne and a typical investment property would be cash flow neutral. Mildura, Swan Hill, Compaspe and Corangamite are other regional Victorian locations that produced better price growth than half of Australia’s capital cities over the last 3 years. The cream on top is that they all have a median house price below $300,000 and are cash flow positive. But, the blinkers need to be removed to uncover little gems like this! Finally, New South Wales. It’s been well publicised that, depending on what and exactly which part of Sydney you purchased in three years ago, you would have seen your capital grow by between 30 and 50 per cent. That’s if you could afford to get in to the market. An hour or so down the coast to Wollongong or north to Newcastle, those markets were also strong however, they are officially the 3rd and 7th most expensive cities in Australia, respectively. But, throughout other parts of NSW, investors will find even more proof that well-chosen regional locations do produce that sought-after combination of affordable investment properties with price growth that was higher than several capital cities and a better annual cash flow. 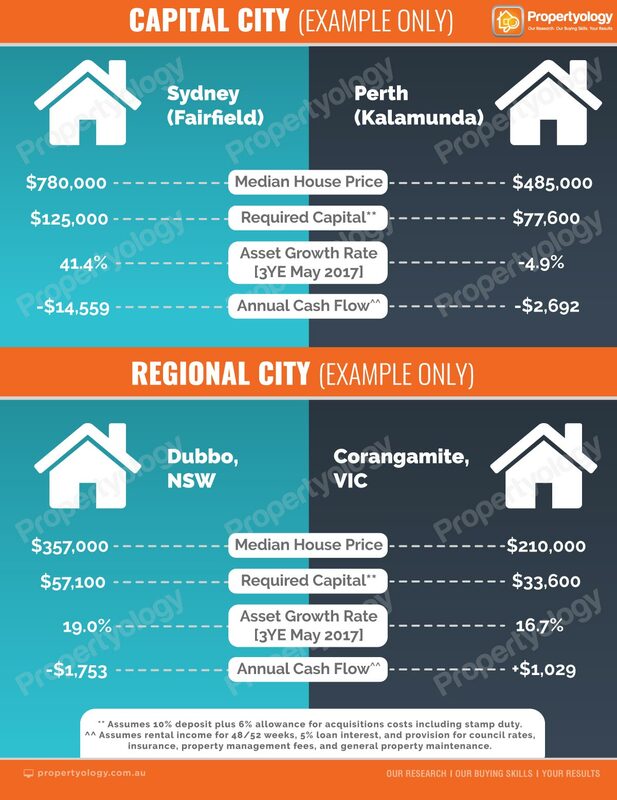 Locations which produced compound price growth of 15 per cent or more over the last 3 years, and have a current median house price of circa $400,000 or less, include Coolamon (25.6 per cent compound growth), Kempsey (23.6 per cent), Dubbo (19 per cent), Leeton (17 per cent), Bathurst (15.7 per cent), and Forbes (15.2 per cent). Every state contains multiple low-profile locations that, while they may not have produced much capital growth over the last 3 years, require very little investment cash flow to hold and perhaps have their better growth years ahead of them. Most households can comfortably save $100 per week so an annual holding cost of approximately $5,000 per year for a property is well within investor’s budgets. 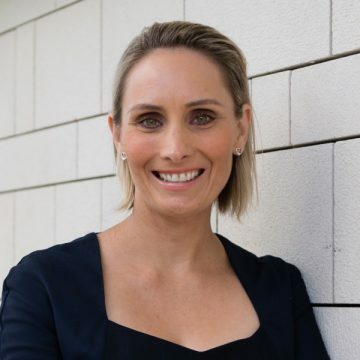 But, those who can afford more, I question the merits of sinking more than $10,000 per year in to one property as opposed to spreading their investment capital over a couple of assets in completely different markets for a similar combined investment. The learnings from this historical evidence is not to jump in and buy in locations that performed strongly over the last 3 years but to appreciate the value in ignoring wives tales and removing the blinkers. Australia is littered with investment opportunities in affordable communities (big and small). The star performers in the next 3 years probably won’t to be the same stars of the last 3 years however, just like Guyra, Goondiwindi and Glenorchy, you’re unlikely to discover these gems through following the herd! Propertyology is a national property market researcher and buyer’s agency. 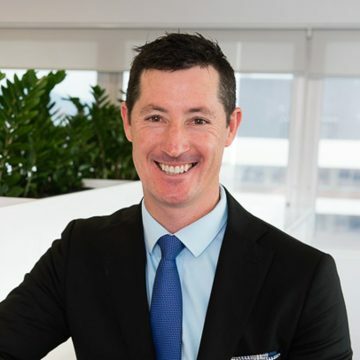 The multi-award-winning firm’s success includes being a finalist in the 2017 Telstra Business Awards and 2016 winner of Small Residential Agency of the Year in REIQ Awards For Excellence. Here’s how our team of skilled professionals can help you to invest.